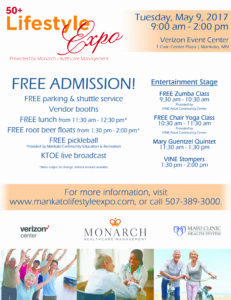 Attorneys and staff from Farrish Johnson Law Office will be at the Mankato 50+ Lifestyle Expo tomorrow, Tuesday, May 9 from 9am to 2pm at the Verizon Event Center. Paul Moosbrugger and Steve Fink will be available to answer your questions about estate planning, trusts, wills, probate, tax law, heath care directives, power of attorney and more. Farrish Johnson Law Office offers a comprehensive range of legal services and we look forward to see you at this exciting event!